Pumpkin can be used in so many baked goods. Its earthy flavor and dense fibrous texture is perfect in cakes, pies, tarts, cookies, scones, bars and squares, and muffins. I love how its orangey brown color stains the batter so you know instantly they will taste of pumpkin. Although there is a Pumpkin Muffin recipe already on the site, I just couldn't resist adding this recipe. These Pumpkin Chocolate Chip Muffins couldn't be more different; as they are more cake-like in texture and taste as they contain butter instead of oil. And while the other recipe uses whole wheat flour and bran, these muffins use all purpose flour (plain flour). But what really sets these muffins apart, is the addition of chocolate chips. A little unusual, maybe, but pumpkin and chocolate are a delicious combination. 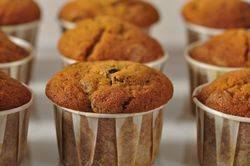 This Pumpkin Chocolate Chip Muffin recipe is adapted from Baking from the Heart, a collaborative cookbook with Michael J Rosen, Share Our Strength (an anti hunger organization) and culinary chefs from all over the country. This particular recipe comes from Joanne Chang, owner of 'Flour', a bakery and cafe in Boston. Now, I have changed her recipe a bit. Her recipe calls for a 9 inch (23 cm) loaf pan instead of what I decided to use, a 12-cup muffin pan. If you would like to make a loaf, instead of muffins, just bake the batter in a 9 inch (23 cm) loaf pan for 50-60 minutes or until a toothpick inserted in the center of the loaf comes out clean. To make our lives easier we really do not have to make our own pumpkin puree as there are excellent brands of canned pure pumpkin on the market today. Just make sure you do not buy the pumpkin which already has the spices added to it. That being said, if you have the time and are so inclined, you can make your own puree using the smaller pumpkin varieties like Sugar Pie, Baby Bear or Cheese Pumpkin (approximately 5-7 lbs., 2 1/2 - 3 1/2 kg.). To begin, first cut the pumpkin in half lengthwise, remove all the seeds and stringy fibers, and then place cut-side down on a greased baking sheet. Bake at 350 degrees F (177 degrees C) for approximately 45 minutes to 1 1/4 hours (depending on size) or until easily pierced with a knife. Scoop out the pulp and puree in a food processor until smooth. You do need to extract all the liquid, so strain the pumpkin through a cheesecloth lined strainer and then cool the puree before using. Pumpkin Chocolate Chip Muffins: Preheat your oven to 350 degrees F (180 degrees C). You will need a 12 cup muffin pan. You can butter or spray the muffin cups with a non stick spray. Or you can line the muffin cups with paper liners. In a large bowl, whisk together the flour, baking soda, ground spices, and salt. In the bowl of your electric mixer, or with a hand mixer, beat the butter until smooth. Add the sugar and beat until light and fluffy. Add the eggs, one at a time, beating well after each addition. Beat in the vanilla extract. Scrape down the sides of the bowl as needed. Add the flour mixture and pumpkin puree and beat just until everything is mixed together. Fold in the chocolate chips. Fill the muffin cups evenly with the batter using two spoons or an ice cream scoop. Place in the oven and bake for about 18 - 20 minutes, or until firm to the touch and a toothpick inserted in the center of one of the muffins comes out clean. Place on a wire rack to cool.